The importance of storytelling to nonprofits from JD Lasica on Vimeo. When it comes right down to it, nonprofits and public-benefit organizations have a hard time telling their own stories. They assume that the public shares their passion for the cause, and so they move on to conveying dry stats and research reports to buttress their case instead. 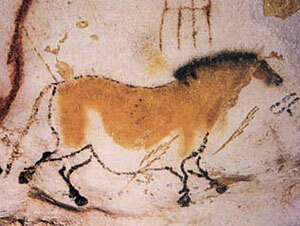 Cave painting of a dun horse at Lascaux, France. At 17,000 years old, the oldest story? They should be telling stories. Suzanne N. Smith, head of Social Impact Architects in Austin, Texas, discusses why storytelling is so important to nonprofits — and, indeed, any organization. She gave this 15-minute video interview at the recent Social Enterprise Alliance Summit atop the Hyatt in downtown San Francisco. Says Suzanne: “I’ve seen nonprofits bury themselves in text and data, and we’ve forgotten the stories that are inherent in the work that we do.” Her stirring presentation was about how to surface those stories and balance them with the hard data that makes nonprofits effective and efficient. Why do nonprofits have a hard time telling their own stories? Smith cites the Red Campaign around HIV-AIDS and breast cancer organizations like Race for the Cure and the pink ribbon as good examples of “identity campaigns” using storytelling that associate an organization with a worthy cause. She also cited NotForSale as an effective campaign for its use of individual stories. She cited the oft-told aphorism: “People won’t remember what you say or what you do, but they’ll remember how you make them feel.”JD Lasica, founder and former editor of Socialbrite, is co-founder of Cruiseable. Contact JD or follow him on Twitter or Google Plus. Excellent interview, JD. Suzanne makes a strong case for why storytelling matters, not just for non-profits, but for all companies. I'd love to find out more about the sources of the storytelling research Suzanne mentions in the video. Would she be willing to share that? My speech is a blend of many sources of books I have read, experiences, and the teachings from great MBA professors at Duke. Here is a starter list: Made to Stick & Switch by Chip & Dan Heath; Predictably Irrational by Dan Ariely; Influence by Cialdini; and anything by Seth Godin. I also did background reserarch on how scientists are proving why storytelling works. Thanks for your comment – if I can provide anything else, let me know. What a great resource! I use something similar during my trainings and with my clients and it mirrors how Hollywood screenwriters and scriptwriters think about their storylines. Your pieces is very similar! Great work! Thanks for the comments! Jeordan, I'll ask Suzanne, I'm sure she'll be happy to post some pointers. Good article – being a business storyteller myself, I couldn’t agree more! Re. the research on storytelling, there are a number of articles on my website, plus in my books, ‘Tales for Change’ etc. available from Amzone or Kogan Page publisher that you might find useful. Story telling goes back to the caves in Spain? Um, no, oldest multimedia is probably on the exposed walls of caves in Arnhem Land, Australia, where indigenous peoples of the country have been storytelling, with music, of the dreamland for… 60,000 years? Good point – to clarify – it is the first RECORDED story based on my outside research of anthropology. I'm sure it is debatable, but I'll leave that to the real scientists! The point is still the same – we use stories for multiple purposes and it brings us to a primal place where stories were our main way of communicating with others. Hey thanks for the blog, right now I run a web page design to help non profs promote their causes from shooting, editing, uploading to creating a buz for their cause. Mediasetfre hopes to help out at least one hundred cause this year. Looks like, trackback doesn’t work. Can I ping your text?